The AP aftermarket & service department is your key to maintaining your equipment efficiency over its entire lifetime. With a dedicated team of experienced technicians and engineers with the in-depth machine and process knowledge at hand, you can set your mind at ease. Follow the links for more information about our services. At AP we care about your investment and fully understand the value in machine up-time. Therefore our aftermarket team always gets involved at an early stage in all machine projects to obtain valuable information about factors such as material deviations and machine unique assembly processes. Even the most robust machines will fail mechanically over time unless measures are taken. Scheduled regular service is a good beginning as a preventive measure but at AP we believe that setting up a system for preemptive data driven decision making is even more valuable – avoid the failure by anticipating it utilizing a real time monitoring system that will alert you when the equipment parameters deviate from set values. Your equipment can normally do a bit more than it was sold to do. When you are comfortable with a higher machine output we recommend that you let our team perform an optimization study to project the possibility of a performance improvement. By letting our team perform a thorough analysis of the overall system we can find patterns in real-time and historical data that indicates that mechanical changes or changes in the program could bring out a higher yield or OEE. Machine cycle time analysis and actions for better balancing between stations and overall speed improvements​. Analysis of machine tuning with a focus on process windows and avoiding damaged products​. By improving one or more OEE segments, production costs per product can be significantly lowered​. At one customer, we increased the yield by 27% in less than one week. The increasing level of network-connected equipment and rising speed of data transfer are opening up for new possibilities for direct support in the service field. Utilizing the latest remote support technologies, Automationspartner can provide shorter response times together with higher system availability. Traditionally, our customers would have to wait for a service engineer to arrive at your location before any corrective measures could be taken. Today, many issues can be resolved or analyzed by remote means, limiting the on-site time for analysis to a minimum and preparing the correct service equipment or spare parts prior to dispatch from our company. Most machine equipment from Automationspartner can be retrofitted with the technology required for securely accessing it remotely over an encrypted line. Hence, you do not need to worry about spreading sensitive data. To further secure your machine data, a mechanical key switch can be installed and only switched on when you let our engineers access your machine. If you are ready to take the leap into Industry 4.0 and IIoT you should continue to read about how we integrate real-time data monitoring and analysis systems into our equipment. Being a forerunner in utilizing real-time data analysis and the concept of connectivity in the MedTech industry, we have developed the tools and knowledge to efficiently work with predictive maintenance and continuous machine optimization. Boost the skills of your personnel by letting them tap into 30 years of MedTech experience through our on-site classroom or production floor training sessions. We offer individually configurable training courses for technical personnel on all levels – from machine operators to technical management and decision makers. 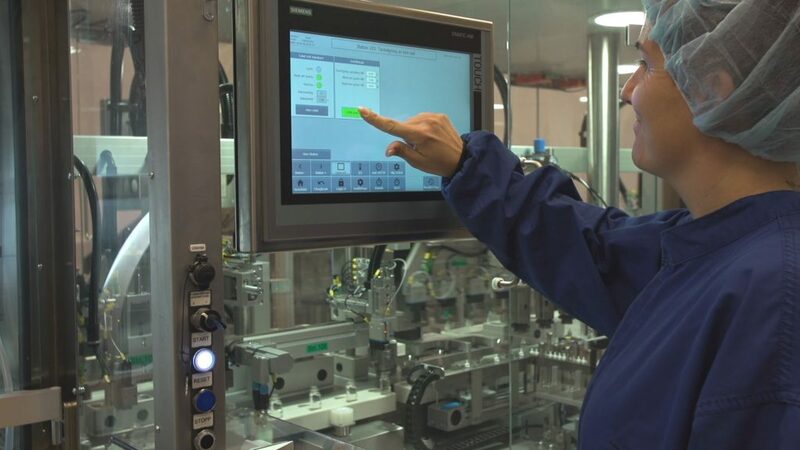 A few hours spent on technical training could raise the machine competence of both experienced and younger team members and cause a foundation for qualified decision making and avoid unnecessary downtime. The industry is constantly changing and over time your investment will slowly be outperformed by new technology and knowledge. Sometimes small changes such as a new computer or a more efficient vision system can bring your equipment up to par with newer machine lines. However, when it comes to older machine lines we normally conduct a complete overhaul of the system to prolong its life time and secure that replacement parts are still available. Direct and extensive support is vital in today’s competitive market and something that we at AP see as a key responsibility. We understand that the level of support needed by our customers is based on individual needs and circumstances, which is why we offer individual customized AP Care maintenance agreements with a specific range of services. A simple and efficient way to increase the technical skill level in your internal service department, without adding more overhead costs, is to contract one of our technicians to work on your site on a regular schedule. In this way, you can avoid mistakes by having access to our expertise on site. Our technician will also be able to bring reoccurring issues or new possible solutions to the attention of our service management for evaluation. A typical on-site technician contract schedules a technician to be on site one day per week. Contact us for more information about scheduling a technician. All AP equipment is tailormade and fine-tuned to perfection with thousands of parts with high-tolerance materials and surface treatments. In order to keep your machine in perfect condition, our aftermarket department finds pride in keeping a rigorous documentation level, regarding every single part and detail of each machine – from the early 1990s up to today. Regardless if it is a standard branded component or a wear and tear part unique for your equipment, AP will efficiently deliver it to you. Our aftermarket department also manages the recommended spare parts list and can help you stock keep critical components. Contact us for more information about stock-keeping of critical parts . "Automationspartner is one of the leading medtech automation service providers in Scandinavia. The company was founded…"